This Site is owned and operated by Patricia Summers and Wake Up Humanity.com. Wake Up Humanity.com and Patricia Summers makes no representation that materials in this section of the Site: "Ancient Land of The Pacific Northwest" are available for use in any other locations. Any claim relating to, and use of this section of the site: "Ancient Land of The Pacific Northwest" and the materials contained herein is governed by United States Copyright Law and International Treaties. The material provided in this section: "Ancient Land of The Pacific Northwest" is protected by law, including, but not limited to, United States Copyright Law and International treaties. The copyright in all material provided in "Ancient Land of The Pacific Northwest" is held by Patricia Summers and Wake Up Humanity.com Oregon, USA. All rights are reserved. The material in this section, "Ancient Land of The Pacific Northwest" is protected by copyright including all text, graphics, photographs and Google Earth images. None of the material may be copied, reproduced, distributed, republished, downloaded, displayed, posted or transmitted in any form or by any means, including, but not limited to, electronic, mechanical, photocopying, recording, or otherwise, without the prior written permission of Patricia Summers. This little adventure of mine began on February 7, 2010, spotting part of a sentence from the corner of my eye in Google about some circles found in Oregon by someone using Google Earth. I felt a little curiosity rise, so I decided to click on it and have a look. Immediately I felt a rush of excitement looking around the land where the circles were found. I don't know how to explain it, but I could sense there was much more, so I downloaded Google Earth, never realizing where that one moment of making that choice to click would take me in my life. You see, it opened doors within me of a long forgotten sense of inner knowing that what we call a human being holds the potential of owning ability wise and this is the greatest truth which has been kept from us while in our sleep down here from those who had access to this higher truth across eons of generations, but kept it hidden. Today across the board humanity is in the beginning stages of awakening to our own phenomenon from how we create our personal realities to our world wide reality based on the belief systems we have taken on as our truths. We are realizing through scientific studies consciousness exists in all forms of life as well as the Universe itself and everything in between. We are waking up to the fact that our ancestors knew there is absolutely no degree of separation with anything that exists, hence a time or two ago humanity was fully aware there was a marriage of harmonious interaction between our beautiful planetary body, its consciousness and us. For example, the ancient pyramid systems and cities that were methodically dotted around the entire planet in high energy fields. They were aware of combining a very simple formula of particular stones and water in conjunction with sacred geometry which was "tuned" into or aligned to our sun and/or various star systems. All for the intentional purpose of increasing the frequencies that produced a direct affect on all Souls whom resided there. The higher the frequencies we reside in and are continually exposed to, the more our consciousness opens and expands, the more self/spirit aware we become. A prime example of this is when any master teacher, elder, shaman or anyone wishes to receive inner guidance, they have always gone off to a location they intuitively sensed was of a purer or higher nature to it right? Could you imagine living in that on a daily basis? Well they did and kept intelligently/spiritually evolving in the process, again, all for the purpose of bringing them consciously closer to their Spirit, our star brothers and sisters and what we call God or Creator. They were fully aware they were members of a universal family that existed in multiple star systems who consistently shared knowledge and various forms of technology which always seemed to boil down to one thing; the great interaction of all that exists. It has been proved through quantum physics if we as humans do not perceive something, in our reality it does not exist as there is no conscious interaction between the observer and the object.. The ancient long forgotten civilizations learned to interact in their relationship with cosmic and planetary energies and this is what we have forgotten in our modern societies.....that each and every Soul who has ever incarnated onto this planet has also entered a profound deep relationship. A relationship with the planet and all kingdoms of life forms, from the mineral to the ethereal, from the very soil we stand on and receive our food from to the air we breathe and water we drink...we are forever in relationship co-existing, co-evolving and co-creating whether our current modern collective level of understanding is aware or not. Fortunately, what we continually discover through our current technology is our ancestors were at a much higher state of awareness of knowledge and knew how to for instance in this context, create monolithic structures and statues, the precisely cut megalithic stones used for building, Nazca, etc. So the possibility of these massive configurations in the northern tip of the Great Basin being "real" long forgotten remnants of ages past could very well be true and as with everything, they were put there for a reason. It cannot be coincidence three people have informed me that upon gazing into the eyes of the configurations, they feel a "pull" as if their consciousness is being pulled or drawn through some kind of portal or multidimensional doorway. Yet again, another example of what our ancestors were fully aware of; the infinite conscious interaction between humanity and that which exists on our planet... there is no separation. This beautiful planet of ours holds an infinite amount of mysteries that defies explanation our current mindsets can fathom or accept easily. Yet, throughout time all ancient civilizations have recorded testimonies of "visiting gods" or giants that once walked the earth and brought incredible teachings to develop a higher, more expanded state of consciousness. With Atlantis, we hear tales of crystal and various other forms of technology that we would find unbelievable and incredible today. In South America and Central America we hear legends of advanced technology that speaks through their monuments, legends and codex's and then of course we have Egypt and ancient Sumeria that clearly show the Ancients worked with advanced mechanical devices and technology. Then my mind wanders to places in Peru like Markawasi, not to forget the whole of Machu Picchu distinctly shows a facial profile and in Colorado a massive carved sphinx and configurations of animals were found, along with giant mummies, unfortunately I can no longer find the information once provided on the net regarding this. What I find most interesting is whether it is an act of nature or man or both, it seems wherever these configurations are found, they are all located or grouped in one area. My questions are, "What are they trying to tell us and what can we learn from this? As you will see after looking through all the images and star alignments as my story unfolds, this is one of those journey's that began on a very simplistic level and as the month's passed in it's introduction to me....... progressed and graduated into something I personally found utterly amazing. This ancient site is located near Paisley Cave, Oregon, where they found the oldest human remains (feces) discovered in the America's to date, 14,300 years old I believe. When I spoke with a representative from the Northern Paiute Council, she agreed, the monolithic configurations I initially found and showed her in February 2010 dates back prior to their ancestral history of 16,000 years. 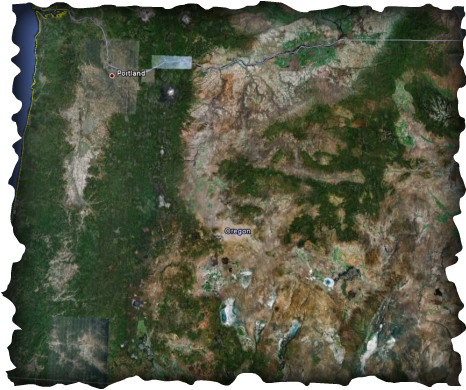 As the days turned into months scrutinizing the state of Oregon through Google Earth looking for more configurations, I wanted to test this even further so I went cruising around northern California, southern Washington and eastern Idaho. I thought okay, if these configurations were only a freak phenomenon from Nature, then I might be able to find them elsewhere, aside from what is already on the net. To date, I have not found any. I have no doubt there is much more out there on this beautiful planet, however and this just might be a personal thing, while cruising around I never felt the "pull" like I did in Oregon. This pull I speak of was a nagging feeling I kept experiencing to go in a certain direction and when I got to that location, though I may have not seen it right away, I could feel it in my bones something was there........like the Shaman Mural.......it took me months of continually going back before I walked into my office one day and clearly saw it on the screen. In my opinion, the entire planet is an actual living library and holds infinite mysteries. In addition, all ancient legends speak of this time as the time of truth, when the truth of our history, human potential and lineage will be revealed. "The truth unveiled. For those who have eyes to see, let them see. For those who have ears to hear, let them listen. For those who have neither, let them pass on." Please continue with my journey beginning with the "Spirals" page, which you will find under the Ancient Land of The Pacific Northwest drop down menu.